Revolutionary and innovative are just the two of the many traits that set Classic Equine Accessories apart from the rest. Thats why we designed the Weekender Duffel; we understand the way you travel. 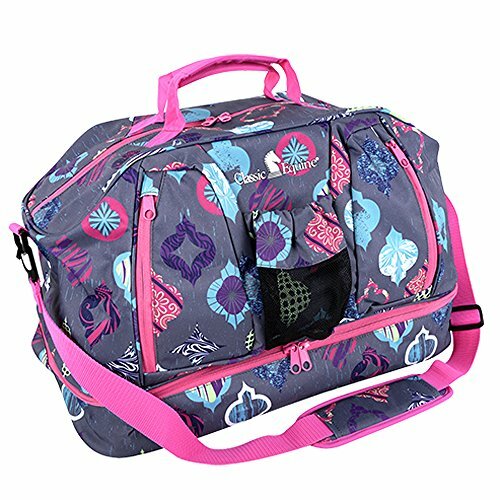 Our Weekender Duffel is very unique in that it was designed exclusively for the equine competitor and traveler. It has a uniquely large undercarriage compartment that is perfect for soiled boots or sneakers, keeping them away from your clean clothes. This duffel is roomier than most, allowing you plenty of room for all the items your weekend trip requires. Outside pockets and drink carrier are just plain convenient. As an added bonus, a full-size folding makeup case is inside. It holds all your toiletries and makeup in zipper compartments, and it unfolds to hang anywhere. Specially designed for the close-quartered bathrooms found in most trailers. If you have any questions about this product by WEQUINE, contact us by completing and submitting the form below. If you are looking for a specif part number, please include it with your message.